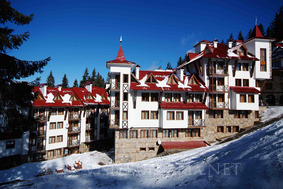 Pamporovo Castle Hotel and Apartments in Ski Resort Pamporovo in Bulgaria - information and bookings. - 14=12 during 07 Jan - 31 March 2019. Location: Pamporovo Castle is located in the heart of the Rhodopi Mountains. It offers breathtaking views and is just 100 metres from the nearby extensive ski runs. The impressive on site facilities and stunning location creates a unique atmosphere ideal for families and children. Accommodation: Pamporovo Castle offers variety of one- and two-bedroom apartments. Almost all apartments have terraces, fireplaces and storage rooms. Residents can enjoy the garden barbecue and deck-chairs in the summer, and the great skiing in the winter. The apartments have direct dial telephone, satellite/cable TV, radio, internet access, safe deposit box, minibar, fridge, electric cooker, cooking facilities, tea/coffee facilities, work desk, bath/WC. Hotel Facilities: information, laundry and dry cleaning, outdoor parking lot, shops and boutiques, restaurant, lobby bar, elevator. Sports & Recreation: fitness centre, solarium, sauna, massage, jacuzzi. Fitness inside the complex is available all year round.